This week, a federal judge awarded a total of $6.75m to the 21 graffiti-artist plaintiffs whose works were destroyed in the now-famous 5Pointz case. We’ve been following this high-profile litigation since its inception, through an interim summary judgment and ultimately a trial. The trial culminated in a jury verdict for the plaintiffs, but the parties had agreed that the jury’s decision would only be advisory, serving as a recommendation to federal district judge Frederic Block, who would have the final say. Now, Judge Block—in a lengthy opinion—has weighed in, ordering the defendants, real estate developer Gerald Wolkoff and multiple Wolkoff-owned entities, to pay significant damages. Our previous posts contain more detail, but to recap, the subject of the dispute is a piece of property in Queens known as 5Pointz, which at one time served as a remarkable repository of a huge amount of graffiti art. Beginning in the early 1990s, Wolkoff allowed artists to create works on the old industrial buildings that then occupied the site; indeed, by 2002, one artist, Jonathan Cohen was appointed as a volunteer “curator,” selecting artists and setting community standards. 5Pointz attracted nationally- and internationally-renowned graffiti artists, tourists, and fans for years. In 2013, the owners announced plans to demolish the 5Pointz buildings in order to build a residential complex. In response, Cohen and a group of graffiti artists who had created works on the site filed a lawsuit seeking to prevent the destruction of the artworks, invoking the Visual Artists Rights Act, 17 U.S.C. § 106A (also known as VARA), which provides, among other things, that artists have a right, under certain circumstances, to prevent the destruction of “work[s] of recognized stature.” The federal court refused to issue a preliminary injunction to preserve the works while the lawsuit proceeded, concluding that the artists had not shown “irreparable harm” as required to warrant injunctive relief. Just days after that ruling, the owners whitewashed the site. In his subsequent opinion at that early phase of the case, Judge Block warned that, although in balancing the interests of the artists and the property owners, he had refused to interfere with the owners’ ability to develop the property, the owners might nevertheless face money damages. See Cohen v. G & M Realty L.P., 988 F. Supp. 2d 212, 214 (E.D.N.Y. 2013). Thereafter, the graffiti artists shifted gears; having failed to stop the works’ destruction, they instead began seeking damages under VARA, in part based on allegations that, among other things, the whitewashing was “gratuitous and unnecessary”; carried out in a crude manner meant to cause maximum indignity, shock and trauma; and denied plaintiffs the opportunity to remove, preserve, or document their work before the demolition. Following discovery, both sides moved for summary judgment. The court ruled that the case should proceed to trial. See Cohen v. G & M Realty L.P., Case Nos. 13-CV-05612 & 15-CV-3230, 2017 WL 1208416 (E.D.N.Y. Mar. 31, 2017). The judge dismissed plaintiffs’ state law tort claims as preempted by federal law—i.e., by VARA— but allowed their VARA claims to move forward, holding that the question of whether the destroyed works were of “recognized stature” (a term that is used, but not specifically defined, in VARA) was a question best left to a jury, with assistance from expert witnesses. The court also dismissed the defendants’ counterclaim for abuse of process. In November, following a three-week trial, the jury found that the artists’ rights under VARA had been violated as to 36 of the 49 works of art at issue; that Wolkoff had acted wilfully; and that the artists should be compensated accordingly. In this week’s opinion, Judge Block also sided with the artists. He agreed that Wolkoff had willfully violated plaintiffs’ VARA rights with respect to the 36 paintings, and in fact went further, finding that “liability and willfulness should attach to an additional nine works.” He concluded that, in light of “the abject nature of Wolkoff’s willful conduct,” the artists should receive “the maximum statutory damages under VARA for each of the 45 works of art wrongfully and willfully destroyed,” for a total of $6.75 million. The judge’s opinion first reviews the statutory scheme of VARA, in particular noting that § 113(d) of the statute “provides for two possibilities when a protected work of art has been integrated into a building subsequent to June 1, 1991, VARA’s effective date.” The first possibility covers works that cannot be removed from the building without causing destruction, mutilation, or other modifications to the work; in such cases, the artist may sue to prevent the destruction of the work unless the right is waived in writing. 17 U.S.C. § 113(d)(1). The second possibility deals with works of visual art that can be removed without causing such harm; in such cases, the artist has the opportunity to salvage the work within 90 days’ notice from the building owner of the owner’s intended action, but if the artist does not remove the work or cannot be notified within that timeframe, the owner may destroy the work. 17 U.S.C. § 113(d)(2). The court also discussed the statutory availability of damages. Federal copyright law allows for an award of statutory damages for a violation of VARA, with the court having discretion to set the amount between $750 and $30,000, or, if the plaintiff shows that the violation was willful, up to $150,000. Alternatively, a plaintiff may seek to establish his or her “actual” damages, to which no limit applies. The court also made a particular point of addressing the “extraordinary work” of the jurors, who diligently sat through a lengthy trial before the plaintiffs, “at the veritable 11th hour… suddenly decided to convert the case to a bench trial.” The court noted that the input of an advisory jury was particularly appropriate “on issues that require judgment of the community.” Here, the jurors were asked with to determine whether each destroyed work was of recognized stature and/or was mutilated, distorted, or otherwise modified to the prejudice of the artist’s honor or reputation by the whitewashing. Judge Block then reviewed the evidence, including evidence about the artists’ “professional achievements and recognition in the form of an impressive array of fellowships, residences, public and private commissions, teaching positions, media coverage, and social media presence”; evidence and photographs of the works themselves, which, he said, “reflect striking technical and artistic mastery and vision worthy of display in prominent museums if not on the walls of 5Pointz”; testimony about how the site and artist community at 5Pointz evolved over time; and expert testimony about the works, their merit and value, and their removability from the buildings. Judge Block also noted that defendants’ primary witness, Wolkoff, “was a difficult witness” who “frequently ignored or challenged” the court’s instructions, was “argumentative and prone to tangents, and had to be threatened with contempt charges. Finally, the court made a work-by-work assessment of each piece of graffiti art at issue, concluding that 45 of the 49 works achieved recognized stature. And it noted that, even for works not of “recognized stature,” VARA also protects works from “intentional distortion, mutilation, or other modification . . . [that] would be prejudicial to [the artist’s] honor or reputation.” 17 U.S.C. § 106A(a)(3)(A). The court noted that this idea of what is prejudicial is an “inherently murky” concept, but concluded that, as to the 45 works of “recognized stature,” the issue was “academic” only, because the court could only make one statutory damages award per work anyway. As to the four works that were not of recognized stature, the court held the works had not been modified in a manner prejudicial to the artists’ honor or reputation. In contrast, the court held that statutory damages were particularly appropriate where actual damages are difficult to calculate. And on the issue of wilfulness, the court pulled no punches, calling Wolkoff’s conduct “the epitome of wilfulness.” The court observed that Wolkoff knew the artists had invoked their rights under VARA and could have given them 90 days to try to preserve their works—a task that, according to plaintiff’s conservation expert, was feasible in many cases. Instead, the court held that Wolkoff acted “precipitously” in whitewashing the works, and his “recalcitrant” and “unrepentant” behavior led the court to conclude that the whitewashing had been “an act of pure pique and revenge for the nerve of the plaintiffs to sue to attempt to prevent the destruction of their art.” Indeed, the court held, in imposing the maximum available statutory damages, “If not for Wolkoff’s insolence, these damages would not have been assessed.” The court was also particularly troubled by Wolkoff’s decision to whitewash the buildings long before they were actually demolished, noting that if he had not destroyed the works “until he received his permits and demolished [the site] 10 months later, the Court would not have found that he had acted willfully” and would likely have awarded a smaller amount of statutory damages. Wolkoff has apparently already told one publication that the decision is “insane” and that he intends to appeal. A number of art law commentators have also opined that an appeal seems inevitable. But the impact of the decision comes from more than just its legal analysis. First, the court’s words of praise, bordering on reverence, for the destroyed works is indicative of a recognition that graffiti art is here to stay as a respected art form. Block closed the opinion with a lament that the public was robbed of its opportunity to “say goodbye” and pay “tribute” to the remarkable site. And second, the court’s no-holds-barred condemnation of Wolkoff’s callous treatment of the artworks is a warning that even if a property owner intends to destroy an artwork, a respectful and collaborative approach to that task may save the property owner from increased VARA liability. 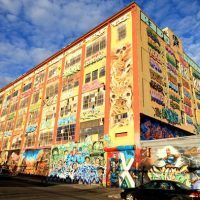 Some commentators have suggested that the 5Pointz case may actually hurt graffiti artists, by causing property owners to be leery of allowing such art projects on their premises for fear of liability. But, as Block pointed out in a footnote, “all this could have been easily avoided with a written waiver of the artists’ VARA rights up front”; hopefully, property owners need not avoid working with artists, but can instead do so through proactive negotiations and contracting prior to a project, to ensure that both sides understand their rights and can strike a legally sound, economically fair deal that balances all interests.